Booking an appointment with the doctor of your choice using a website or mobile app is a common thing in the developed parts of the world. But for people in Bangladesh, this is a very unique and almost unheard of concept. Not now though. This concept is brought out here by Doctorola-one of the most successful startups emerged in the last few years. Fintech recently had a talk with Mohammad Abdul Matin Emon, Managing Director of Doctorola and learned a few things about him and the story behind the formation of his people centric venture. FINTECH: You have been a tech professional from the very onset. Can you shed some light on your career? MAM Emon: I have started my career in 1994 at a computer hardware selling company. After staying there for quite a bit, I switched and joined a software company in 1997 as the software business in Bangladesh started to flourish at that time. I concentrated on developing enterprise resource planning (ERP) software as I felt that the business of ERP solution would pick up soon. I built an ERP called “Summation” back in 1997-98. Those were obviously very early days of any integrated business application and being too early in the market had been one of my major mistakes that I could understand later. I tried to sell my ERP solutions to a number of companies. It was not an easy task; I had to pitch them for hours that how ERP solution could actually bring them profit in long run by increasing efficiency in their organizational systems. I succeeded in selling my solutions to a number of companies but it was, I would say quite a daunting task. I could not survive with that business much longer. I had to shut down the business in 2002. Since I had no other option to earn my living, I took a job. I joined a multinational company in early 2003 and stayed there for six and a half years. I had quite a good time there and had been able to build a track record of successes. I learned a lot and was also exposed to regional projects and had the opportunity to work with teams from several countries in Asia and outside. That gave me an exposure to how things are done internationally. After that, I joined a few local conglomerates, one after another of course, all of which are quite renowned. I had played very senior roles including CIO’s (Chief Information Officer) and CEO, in these companies. That was my corporate career with exposure to corporate leadership and strategies. After that once we started to think about this venture, I left my corporate career and joined business again. The idea of Doctorla was born at that time. FINTECH: How did the journey of Doctorola start? Who came up with the idea? MAM Emon: The idea in its very early stage came from one of our software engineers working in a software company that he earlier worked in. In that stage, it was supposed to be an appointment management application for hospitals. We then took an assumption that may be there is also a need for a good information database of doctors that could help the treatment seeking people from different districts traveling all the way to the capital we were operating. In that stage, it was supposed to be an appointment management application for hospitals. However, my founding team members had a deeper intention to build something that is a business and at the same time is capable of creating an impact on the society. We then took an assumption that may be there is also a need for a good information database of doctors that could help the treatment seeking people from different districts traveling all the way to the capital. We started visiting hospitals in the city and started talking to patients who were waiting for doctors there. We heard about their journey and the struggles they had to experience. Many of them described to us how they suffered from delayed recognition of their problems. Many told us about their struggles in choosing a right doctor, finding appointments, etc. Based on our research, we decided to come up with an online directory for doctors. But, a question kept bothering. There was a number of existing online directories already. But, were they being able to serve the purpose? We further investigated and found that most of the doctors’ addresses, contacts, timings published in those directories are outdated, their promotions were inadequate and many other issues were there. We understood that we needed to come up an appropriate business model to ensure that the directory is always maintained up-to-date. Hence came up with the idea of building an online appointment platform or marketplace that does not only list doctors for information, but also ensures connecting patients to the right doctors as a service. FINTECH: Can you give a brief description about how Doctorola work? MAM Emon: Doctorola is a platform that primarily operates a website (www.doctorola.com), a mobile app and a call center number (16484). People can use any of these to find a suitable doctor and submit a request for an appointment. However, these gateways are backed by a huge back office application and databases. It’s far from easy maintaining real-time availability information of thousands of doctors from hundreds of hospitals and locations. 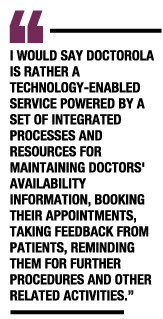 I would say Doctorola is rather a technology-enabled service powered by a set of integrated processes and resources for maintaining doctors’ availability information, booking their appointments, taking feedback from patients, reminding them for further procedures and other related activities. For listing a doctor on the platform, Doctorola signs agreements either with individual practicing registered doctors or with a hospital/clinic bringing all their doctors on the platform together. The next step is about maintaining regular availability information involving a dedicated relationship team each assigned to a range of doctors. The call center shoulders the responsibilities of handling all service requests and patient interactions. FINTECH: How many doctors you have incorporated with the app? How many people have already benefitted so far? MAM Emon: Doctorola currently hosts appointments for more than 7,000 doctors from almost 500 hospitals in 61 districts of the country. There are general practitioners (i.e. MBBS doctors), dentists, specialists and many senior professors. The best part is that among these doctors, a huge number joined Doctorola spontaneously by registering themselves online through our website. So far, we have been able to serve more than 85,000 appointments to our member doctors. We maintain a continuous relationship with most of our doctors. We invite them on different programs and occasions for speaking and sharing knowledge with people. We also invite them time to time to Doctorola TV (YouTube based channel) to participate in live talks or recorded interviews. We have so far got tremendous support from our doctors. FINTECH: BD Venture has financed you. How important it is to get financed by a VC for a startup? MAM Emon: Yes, we raised a VC fund from BD Venture in 2015 to support our growth that moment. Even after BD Venture, we raised further investments for our next stage growth. Businesses like us that strive to bring about a change in the conventional practices or systems generally take little longer to start fully depending on its own revenue. The period they struggle in establishing the new concept or the new way of doing things, commonly need to be supported by investments. But, investment is meant to be used for growth. Startups must not have expectations of external investments at a very early stage of the business. Investments are only useful once the startup has tested and proven the idea and product in the market and has created a solid, significant growth potential. For supporting that kind of growth in startups, VC or angel investments can play a very important role, I believe. 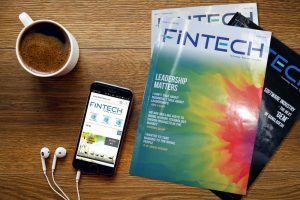 FINTECH: What are the problems Doctorola faces? What is plan for the next five years? MAM Emon: The challenges and the problems are an integral part of a startup journey. And, these are the reasons for innovation in startups. At Doctorola, of many challenges, the biggest one we face is the cost of communication. Communicating to the mass requires using mainstream media. Advertising on those have become unbearably expensive and mostly occupied by the telcos and large FMCG businesses. In next few years, Doctorola will strengthen its feet deep into the current scope of business, i.e. onboarding more doctors and delivering more daily appointments. At the same time, Doctorola will add some significant products to its offer portfolio that has the potential to truly revolutionize the healthcare delivery system in Bangladesh.